Plants cespitose, not rhizomatous. Culms 50-200 cm, glabrous, lower internode plus sheath about 3.5 mm thick. Sheaths ciliate on the lower margins; auricles 0.2-1.5 mm; ligules 0.3-1.5 mm; blades 2-6.5 mm wide, generally convolute, adaxial surfaces 1-8-ribbed, ribs rounded, prominent, spinulose, margins usually thinner than the ribs, pale green. 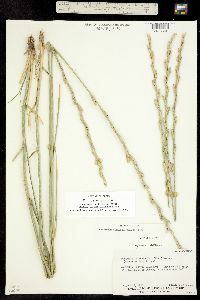 Spikes 10-42 cm, erect; lower internodes 16-42 mm; middle internodes 9-19 mm; rachises glabrous, not disarticulating at maturity. 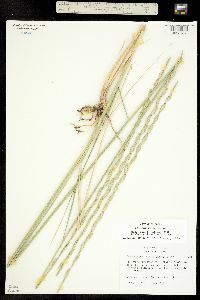 Spikelets 13-30 mm, with 6-12 florets. 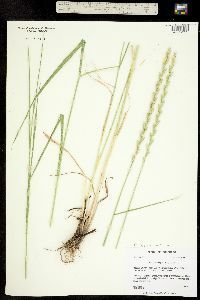 Glumes oblong, glabrous, midveins about equal in length and prominence to the lateral veins, apices truncate, margins about 0.5 mm wide, hyaline; lower glumes 6.5-10 mm, keeled, keels occasionally scabrous distally; upper glumes 7-10 mm; lemmas 9-12 mm, glabrous; paleas 7.5-11 mm, keeled, keels ciliate; anthers 4-6 mm. 2n = 69, 70. 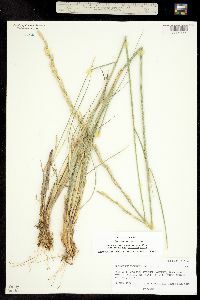 Thinopyrum ponticum is native to southern Europe and western Asia. In the Flora region, it is planted along roadsides for soil stabilization and is spreading naturally, in cooler areas, because of its tolerance of the saline conditions caused by salting roads in winter. 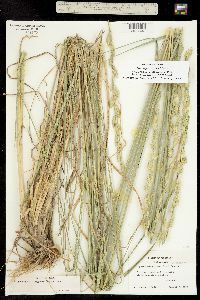 In its native range, Thinopyrum ponticum grows in dry and/or saline soils. 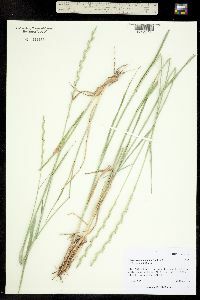 It is sometimes treated as a subspecies of T. elongatum (Host) D.R. 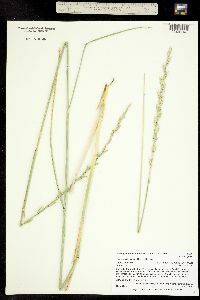 Dewey, a diploid species that grows in maritime regions of western Europe.